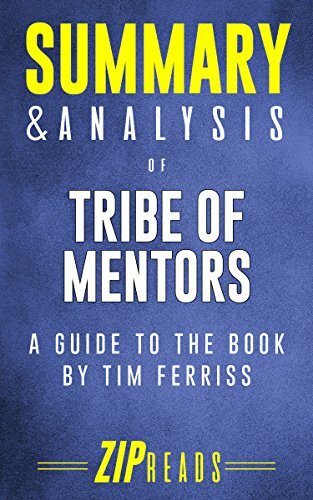 Tribe of Mentors is a 600-page tome for the person asking: “What should I do next?” Tim Ferriss collects insights from the world’s most innovative artists, scientists, athletes, and entrepreneurs to help us learn how to treat failure as a foundation to success and find meaning in our daily lives. This ZIP Reads summary takes the essence of Ferriss’ book and distills the key takeaways into an easy-to-read format. Decide whether Ferriss’ latest book is right for you before you invest the time and money reading it! All of us want to read more, but all too often, life gets in the way. ZIP Reads was started with the mission to make more books more accessible to more people. Our summaries are meant to help you zip through the bestseller list each week and figure out which books are right for you BEFORE you invest your time and money. With ZIP Reads, you can absorb everything you need to know in 20 minutes or less! For starters, he realized he needed some mentors. What if he could ask his heroes—from world-class athletes to award-winning filmmakers and authors to ingenious entrepreneurs—for their answers? He dug deeper into the idea, as he writes in Tribe of Mentors, “Life punishes the vague wish, and rewards the specific ask.” So with a book deal in hand (and a promise to the book publisher to return the whole advance if it didn’t work out) he wrote personal emails to hundreds of his heroes. He asked each person to answer any three to five questions out of eleven carefully curated questions he sent them. He was overwhelmed by the response. While some said no (and said no in ways that became their own lessons for someone who struggles with saying no), more than one hundred people said yes. In Tribe of Mentors, Tim Ferriss compiles the illuminating answers from 140 mentors on what it means to live the life you choose. Mentors range from actor Ben Stiller or filmmaker Daron Aronofsky to astrophysicist Janna Levin, and include real-life experiences with failure, loss, success, happiness, and fulfillment. Get updates on new releases and FREE titles right in your inbox each week!